Handles, the key elements of the kitchen | Rincomatic Blog. Once the distribution and equipment of the kitchen have been decided, we face a wide variety of materials and finishes that will define the aesthetics of the ensemble. The handles profiles, in addition to being functional, will act as a common thread between materials, acting as an important aesthetic component in the set. he profile handles are the ideal alternative when the time comes to choose a modern, minimalist and functional design: Integrated in the front side of the drawer or door, it draws clean lines providing an aesthetic almost without handles, combining functionality with elegance, without putting comfort in opening and easy cleaning aside. Syma, the range of rincomatic profile handles. 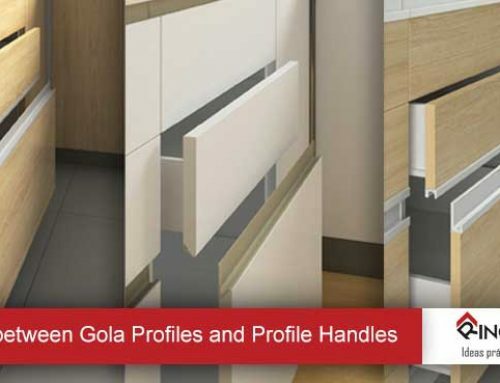 On the one hand, the range of syma handles responds to this trend with four different models: from 50mm channel to the 2mm invisable handle for Flat Gola System, and on the other hand, it does it with multiple finishes: perfectly combinable with any front in melamine, wood, high gloss, acrylic, matt, etc. Without forgetting the customizable profile handle. Each model consists of a complementary handle that once has been installed as a part of the ensemble, simulates a channel or false gola in horizontal or vertical, and installed individually is the perfect solution for opening upper cabinets. Furthermore, it has metallic end caps that provide a smoothed finish without sharp edges. The assembly of the profile handles is no longer a complex task: Rincomatic has developed a precise, agile and clean installation by means of Clip for the entire Syma range. Clip-System avoids machining and minimizes assembly times, becoming the perfect alternative for any type of furniture and a versatile solution for the kitchen designs that last over time.